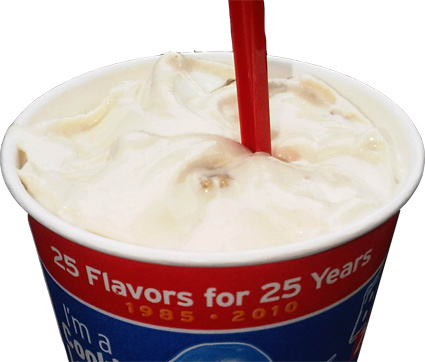 Alright, I was teasing about the bacon in my blizzard, but I wasn't joking about going to DQ today. In fact, I was pretty excited to see the new blizzard of the month. Ahhhhhh, nothing I appreciate more than DQ taking the time to make us a unique blizzard of the month. 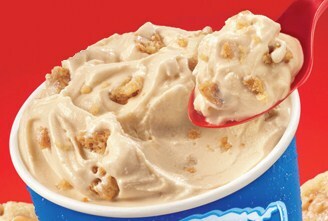 Our potential new friend is Dairy Queen Caramel Toffee Cookie Blizzard which is toffee cookie pieces* and toffee-caramel blended with a creamy vanilla soft serve. (*Cookies contain ground almonds). Look at that nice beige color suggesting a nice caramel flavor, or how about the crazy amount of bits everywhere. Whoa whoa whoa, that looks nothing like the picture... Ok, I always say that, but come up people! It's faintly off white and I see TWO cookie bits. I will tell you right now that the mild color matches the surprisingly mild caramel flavor of this treat. It's mild, really really mild. Granted, there is always the chance it was just my server who didn't put enough flavoring in, but I'm not willing to try again. It's kind of funny because my first impression was "where are all the cookies?" but by the end it was "why won't these cookies go away??" The problem here is that when cookie bits are this dry, crunchy and hard, you quickly grow very tired of crunching. It felt like I was getting 2 or 3 per scoop and it was driving me nuts. I think the problem was made worse by the fact my soft serve seemed a little extra soft so there was no cushion for me when chomping down on these brittle bits. What a bummer. 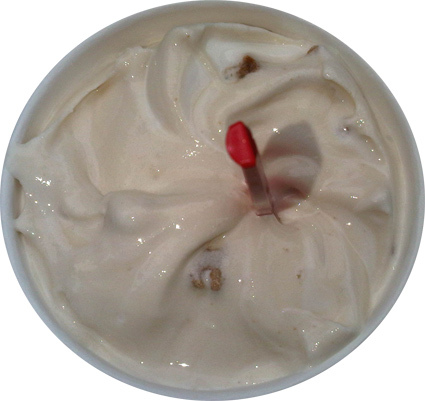 The best thing I can say about this blizzard is that it has a great lingering aftertaste of soft serve and cookie. It's a shame because I was hoping every bite would taste like that. This one is going to be a disappointment for caramel fans... wait, what happened to the toffee? Now that I think about it, I don't remember tasting toffee at all. What's up with that? Man, it must have been even fainter than the caramel. You can try this blizzard if you want, but consider yourself warned. how can cookie bits be dry in a cup of milk and ice cream? i'm still tempted to try this if for no other reason than because it's got cookies in it. they are super dry and crunchy, and are similar to the kind of cookie in the blizzard. it's not a bad blizzard, it's just, well, it was kind of annoying. Despite the horribe review you gave this Dubba I wanted to try this new blizzard flavor. You might need to come give the DQ's in NJ a try because my blizzard was so caramelly it was brown, and the cookies were soft and scattered throughout! There were even toffee chunks similar to the new B&J flavor! I was pretty darn impressed! I'm glad you tried it anyway, because as we all know, consistancy has long been DQ's biggest problem. In fact, you've got me more tempted than ever to give this one a second try. Do it Dubba! I smell a road trip!